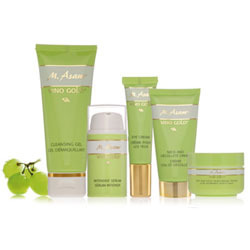 Vino gold by M. Asam is an anti-aging skin care system which fights oxidative aging including your pores, sun damages and blotchiness. It claims it can help make your skin look brighter, smoother and younger. Vino Gold contains three core ingredients which includes OPC (grape seed extract), Resveratol and Cold Pressed Grape seed oil. With your help we can reach more people and let them know about Vino Gold by M. Asam whether this product works or not.